I have trawled this forum and the internet but I cannot find a documented standard for modular layouts for G scale. 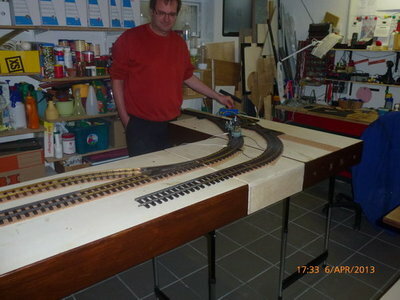 I guess to be more precise G2m (45mm gauge track 1:22.5 scale), but any 45mm track standard would do. Like NTRAK for N gauge. 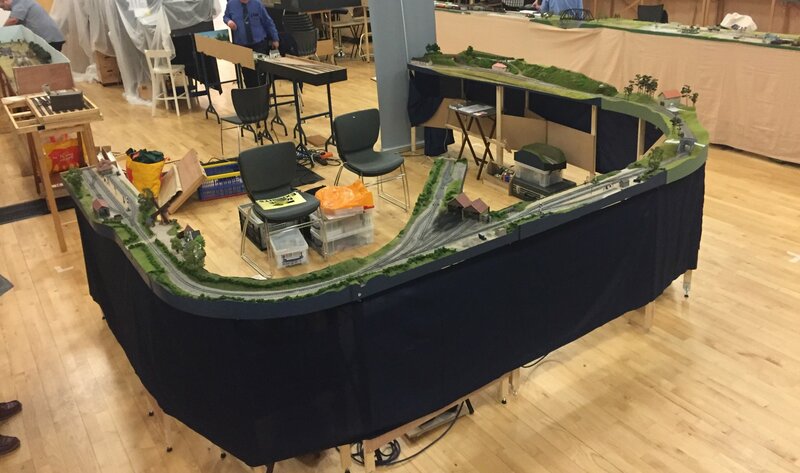 Reason for asking is I will be building a new indoor layout and I want to make it modular so it is easier to take down / put up, not necessarily for exhibition purposes but if such a standard exists I may as well use it. I feel there must be one as I keep seeing references to modular layouts at G scale shows. NRMA just suggests adopting NTRAK for other gauges but use stronger wood! There is a very detailed spec for 32mm gauge on the 16mm society website. I found a few US clubs that have developed there own standards for LGB track. On this forum I found a reference to MOMI which looks useful but does not seem to have been used outside of the group who developed it. I could not find anything on G scale society web site but I am not a member so maybe there is something there. Because your garden isn't modular! The 3CAG GSS group bought a 16mm modular layout, but found if you use R3, the track came VERY close to the outside edge.. I think I would base it on the 16mm standard, but adjust for R3, perhaps? - I guess if there is a G1 standard, you would need a field to put it up in? Dave, I've brought this very question up on numerous occasions, and hit a brick wall! I do have somewhere amongst a collection of files some drawings and measurements (middle of a shed/workshop move) I'll see if I can find them, had thought again about bringing this up at a G Scale Society AGM and trying to get a definitive answer on this very subject. 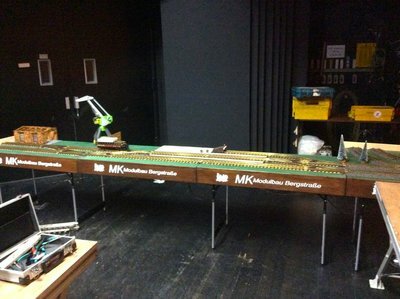 I too will be constructing an indoor layout, and had hoped it would become part of a larger modular layout that could be exhibited. Their is an American Themed HO Modular Layout in this neck of the woods, will dig out the details, to see how they approached and constructed a fairly comprehensive layout with excellent operational potential. If nothing comes of the idea from the UK, will go ahead with construction to match up with my G Scale acquaintances modular themed layouts that are being worked on in, France, Holland and Germany. Lugged a modular section to Germany and Spain last year, so the idea does work! I like the idea, but PLEASE! can we have sensible legs!!! Something stable (very) with just a couple of modules..
No worries, when I constructed the 7mm NGA modular system, many moons ago, all the fittings came from here.. Thanks John. There are standards for other gauges, NTRAK for N gauge being the most well known. I'd be surprised if there wasn't an HO standard. What standard do your continental acquaintances work to? If there is no de jure standard then de facto is next best. My experiences over the last 40 years with modular layouts will bore you to death. First up was N-trak. Our club slavishly followed the concept. The failings, legs, and filler rails. Then a few of us formed subcommittee to design a modular system. First rule, analyse the failings of established systems. The major concern were legs. 4 legs, bolted to the frame in the corners was instantly dismissed. 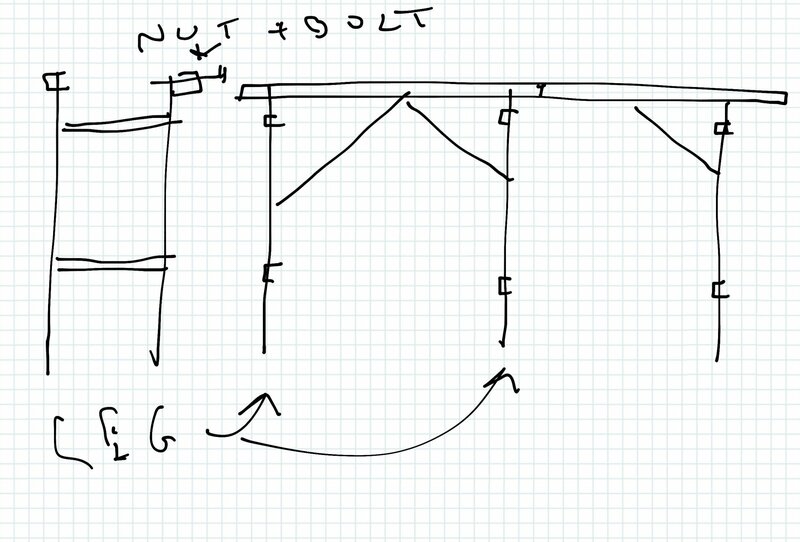 We came up with two legs at one end, cross braced, and hinged to the end frame, that fold up under the module. For stability, an aluminium L section was used between the back leg, and the side frame. The cross section of the leg unit protruded to the outside, allowing the adjoining section to 'rest' its legless end. the modules bolting together. Holes were sloppy enough to allow adjustment so the track, which ran to the end of the module, to join. I still have an Sn3½ layout of 4 modules. Takes me 10 mins to set up on my own. These days, my modules are legless, I'm now an adherent of the black sheet draped table, with module placed on top. Hi Folks, the 16mm association modular standard does cover 45mm gauge as well. The South Birmingham local group have both 32 and 45mm track on their indoor layout, but not to modular standard as it was not written when we built it, (we have altered the end of two boards to allow connecting up to modular standard), this means we can extend for our new year steam ups easily. However although we have quite a few modules with just 32mm track locally, I believe that one of the local groups near London have made a good number of 45mm track modules. The essentials stay the same, 1200mm long straights, track at 150/300mm etc. centres, from the front edge, (there are a few 'specials around at 600mm, 1800mm, and 2400mm in length), curves are based on 1697 radius (c/l of track), and 150mm/300mm/etc. larger or smaller. That applies at the ends, you do what you like in between, and some people make a set of modules which only link to their own butty, and just do the standard at the extreme ends of a set. All track is kept 50mm back from the end of each board, and a 100mm 'loose' joining track piece (and 4 fish plates) used to fill the gap. The height is set at 950 to top of board, if building on a flat floor. Most people have some sort of levelling screw in the bottom of each leg to give 940 to 960ish high but within South B'ham we have some adjustable legs which go down to around 550mm if the floor does slope a little, as some rooms we have set up in have. I also know of garden railways where the end of the odd siding is set to modular standard so that they can add extra length for meet-ups, when a longer run ids nice to have. I have to say that it does work quite well for 32mm and 45mm track. There is more info on the web site ( Modular Layout Standards - Association of 16mm Narrow Gauge Modellers ) if folk want to know more detail, or do ask. I hope that helps you Dave and any others interested. I've been thinking of a modular layout for some time, using baseboards joined by track on LGB bridge piers. What I've found is that modules should be no more than 36-42 inches long by up to 18 inches wide for easy handing and getting in and out of a medium estate car. This does mean that for certain items such as a terminus, you need to join two or even three modules together. Modules can have a backboard up to 18 inches high as a background. I’m involved in two modular groups in HO and based on that standard my own Freem009 and the 16mm one looks a decent starting point adapted to 45mm track. The one thing with a standard like that is the boards aren’t easily reversible without big steps in the ends, unlike our HO and 009 ones, which can make anything but a loop hard to do. Ours also include a DCC bus and connections in the spec. 2 x 1 Timber can be quite good but for a more portable line Ply is to be recommended. My 0 Gauge portable line constructed back in the 70’s and 80’s started out with 2 x 1. But after many Shows it just got to the stage where lugging it around was not fun any more. So I went over to Ply, thicker sections for the Ends where Boards Joined but not much thicker than Hardboard for the Sides and Top. With plenty of supports across and diagonal these boards are surprisingly strong and light enough to lift with one hand before you start putting all stuff on top and below. 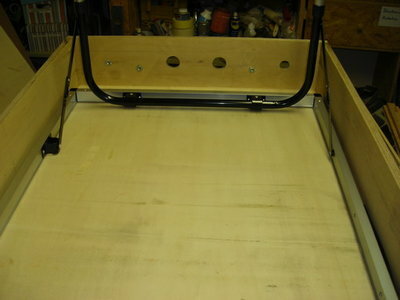 I also paired boards with Hinges as being so light Fold Over into Pairs makes moving and storage much simpler. 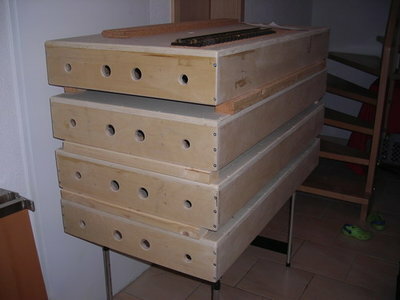 End Plates of Ply are used to keep the ends at the same height as the other end for storage. Buildings can be removable, when well bedded in with Weeds the bases are hardly noticeable. The Joints are also well blended in with Blue Tack and covered in loose Flock and Weeds for running sessions. Legs were made from a section slightly smaller than 2 x 1 in an A/H type layout with a Front of Plain Timber with Angles to form a nice long flat where Boards can be plonked on top and joined up. Hope you can get the concept from my crude sketch. These are surprisingly strong and note only one master Section needs the double Angles to get started when putting up. I would certainly consider the 16mm Standard or perhaps come up with one similar for our scale. 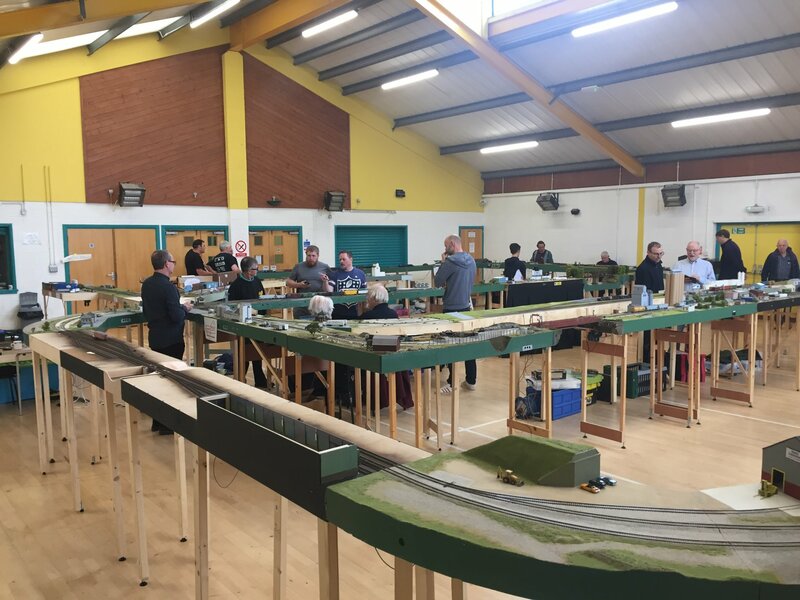 Perhaps then you could publish the Standards and some may even consider building sections to join up for a Layout at Shows, perhaps the G and 16mm ones would be a good target. As for Electrics, Electrical Trunking on the Rear would make Power Issues easier to manage by lifting off the Top and getting to the Joints rather than faffing about below Baseboards. Joints could be with Chock Strips the ones that are used with Spigots on them that make Plugs. Good sized Trunking will take these just fine and loose any spare wire within. Whist mooching about found these, which could well be adapted for a modular idea.. Plenty of food for thought on the modular concept, just needs a recognised UK organisation to put in place recommendations for the use of a modular system that can be used for 45mm G Scale.....one for the G Scale Society to address perhaps? Some pictures of German aquantantices take on the modular idea.. Thanks everyone for your contributions, it has been very helpful. I rely on wherever I am setting up the layout providing table space for it. This requirement is known in advance of course. some years ago i made a small (R1) circular layout consisting of four modules. each module was 80 by 80 cm / 31.5 by 31.5 inch. for legs i just put four foldable tables upside down, the modules resting on the feet of the tables' legs. two bolts with washers at every joint of modules. The German G Scalers appear to be very good at setting up soirée’s with perhaps Paste Tables (good quality ones not the scabby Wooden things), RTR Track, Buildings and even loosely Ballasting them. Trouble is with that approach set up and pull down Times can be quite extended. Very nice Korm, the video at the end of that thread made the most of a simple circle of track.